Tulsa businessman Kevin Stitt became Oklahoma’s 28th governor today, delivering a speech that continued his campaign narrative while fleshing out a goal for state agencies’ accountability. Ahead of Stitt’s remarks, legislators from both parties expressed optimism about a host of issues, ranging from Stitt’s policy priorities to his personality. Stitt becomes Oklahoma’s first top executive since Gov. David Walters to enter the position without previously having held office, leaving plenty of questions about the political and policy narratives he will attempt to craft in the coming weeks, months and years. Echols and other lawmakers acknowledged Stitt’s steep learning curve as a political outsider, but they also expressed hope that he will listen to the broad needs of Oklahomans. Democrats had similar hopes for the new governor. Stitt’s use of the phrase “top-10 state” and “Oklahoma’s turnaround starts right here, right now” punctuated his longshot gubernatorial campaign, and his speech Monday indicated the phrases will continue to frame his narrative as governor. He referenced the “top-10” phrase in the first minute of his remarks, and prior to the ceremony, a public address announcer encouraged the gathered crowd to use #OKTurnaround in social media posts about Stitt’s inauguration. Stitt said his 18 months on the campaign trail and his 300-plus town halls in 77 counties revealed a “mandate” from the people of Oklahoma. “Here’s what I heard. We know we can be and should be a top-10 state. Why? Because we are Oklahoma, proud of our hard-working, God-fearing people,” Stitt said. Echols praised Stitt’s narrative use of the “top-10” phrase. Stitt discussed the state’s top political issue of recent years. “Oklahoma’s turnaround also starts with education,” he said. Beyond education and state government reform, House Minority Leader Emily Virgin (D-Norman) said Oklahoma faces other pressing issues that she hopes Stitt will work to address. Sen. Roger Thompson (R-Okmulgee), the Senate Appropriations and Budget Committee chairman, echoed Echols in praising the Stitt administration’s positive working relationship with the Legislature so far. Asked what he hopes Stitt will recognize as a challenge for rural Oklahoma, Thompson answered quickly. 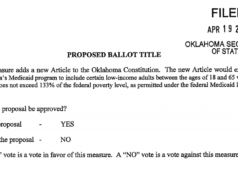 To that end, the state’s most controversial policy discussion concerning health care centers around SoonerCare, Oklahoma’s Medicaid program for low-income citizens. For nearly a decade, conservative lawmakers have pushed for versions of managed care intended to lower costs. Over the same period, Democrats and self-described “pragmatic” Republicans have pushed for the acceptance of additional federal dollars under some version of the “Medicaid expansion” authorized by the Affordable Care Act. Thompson and Virgin both said they hope Stitt will be open to finding a compromise to increase health insurance coverage through Medicaid. Virgin said House Democrats want to find an agreeable plan, too. Virgin said she believes Stitt’s business background could lend him an open mind on Medicaid expansion, which would be funded 90 percent by federal dollars and 10 percent by state dollars. “Gov. Stitt comes from a business background, and in his business if someone said, ‘I’m going to give you $9 if you put up $1,’ I think that’s a deal he would take. It just makes sense,” Virgin said. Stitt enters office with an enormous number of new lawmakers who face an equally steep learning curve. Echols identified two keys to Stitt being able to retain his initially positive relationship with the Legislature after session begins Feb. 4. “One key is remembering we all wear the same jersey, and I don’t mean Republican. I mean Oklahoman,” he said. “We are all Oklahomans, and we all care about what’s going on for this state. Number two is communication. We want there to be open dialogue between the executive branch and the legislative branch, and that’s what we’ve been experiencing.